Tonight for dinner I made chicken pot pie with puff pastry crust. My husband and I smoked the chicken over the weekend on the grill and I made soup from that which then turned to pot pie. I love triple duty meals! I only needed one sheet of the two sheets that came in the puff pastry package so I decided to try and make dessert too. 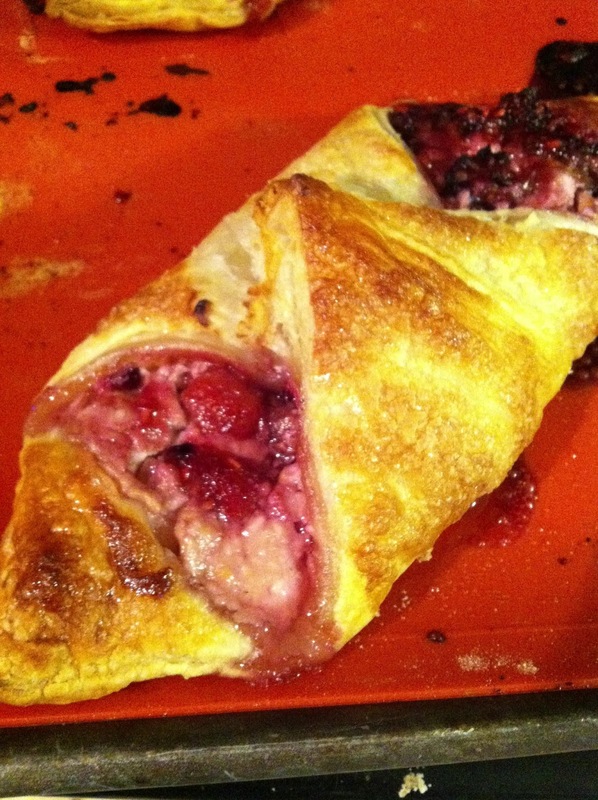 I wanted to make some sort of fruit pastry but didn't have any cream cheese or mascarpone that normally is called for in these kinds of pastry recipes. I did have Chobani yogurt and cottage cheese though. Let me just say that these turned out delicious! And not meant to, but healthier too! Try these out! In the bowl of a stand mixer fitted with the paddle attachment, add cottage cheese, yogurt, egg yolk, sugar, vanilla and zest of half a lemon. Mix well and keep the refrigerator until ready to use. 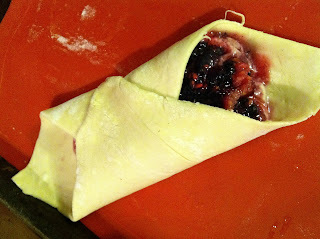 In a separate bowl, add jam, raspberries, blackberries, the other half of the lemon zest. I like to mash all of the fruit and jam together to bring out more of the berry flavor. Lay puff pastry sheet out on a lightly floured surface and roll to about 12x12 inches and cut into 4 equal pieces. 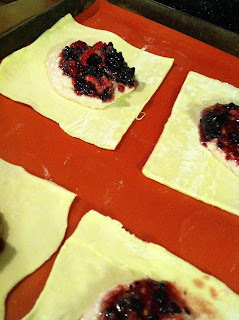 Fill each puff pastry with a heaping tablespoon of the filling and then top it with the berry compote. Make sure to keep the filling directly in the center of each pastry so that it will stay in the pastry and not ooze out of the sides. There are many different ways to fold the puff pastry so that the filling will stay in, but the one I think that works the best is where you just fold two pieces in; overlapping so that some of the filling gets hit with the direct oven heat and gets caramelized and bubbly. (Mix the two in a little bowl.) To seal you can use a pastry brush or just your fingers! Make sure the egg wash is touching the pastry on all edges. 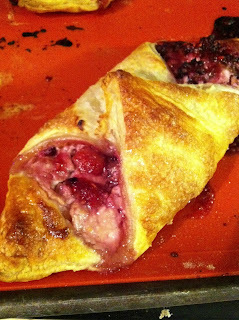 Use a fork to crimp all of the edges to look pretty and hold in the filling. Bake for about 15 minutes or until the pastry is browned and the filling is bubbly. Wow,This recipe looks delicious.I would definitely love to make this. They are really good and easy too!